1.Extremely help for the home exercise, body fitness, lose weight and stretch out the muscles for the people who wear high heels for long time, runners, or anyone who would like some calf and hamstring stretching. 2 There are 3 settings (20, 30, 40 degrees) on this machine that can help you achieve the maximum stretch. Great for warm up and cool stretches. 3.It features multi functional LCD display that indicates exercise time, scan, step count, calories burned, count/min. You can follow the informations at any time during the exercise. 4.Height adjustable secure handlebar, and convenient to setup at homethe, measures: 19.7"" long by 17.7"" wide by 29.5-41.3"" high. 5.It is easily assembled with detailed instructions. 6.This Step Machine has greater weight bearing, its maximum load is about 220lbs. Whether you find it an inconvenience to go the gym, or looking for a gift for your loved ones for the holidays, or simply want to get a head start on your new year's resolution to get in shape, the Taiwan Present GUNBELL Fitness Step Machine Pro Leg Stretcher is perfect for you. Multi-Purpose: You can have a slow walk, or work up to a full run with complete freedom. The machine can also be used for warming up or cooling down before and after working out or intense sports. And LCD display allows you to track your step count, exercise time and calories burned. Effective Twist Movement: Move up and down with side to side twist action, can exercise rarely used calves muscles, gluteal muscles and hip flexors with 3 different stretching levels to bring you the perfect leg lines. Safety and Stability: Both the pedal and the handle are designed for antiskid. The foot pedals are wide and textured to keep feet secure; Height adjustable and non-slip secure handlebar for optimal comfort. This Step Machine has greater weight bearing, its maximum load is about 220lbs. Space Saving: The step machine measures 19.7"long by 17.7"wide by 29.5"-41.3"high. It is good ideal for home or office use, You can use it at any time. When you finish exercise, you can put it in the corner or under your table. 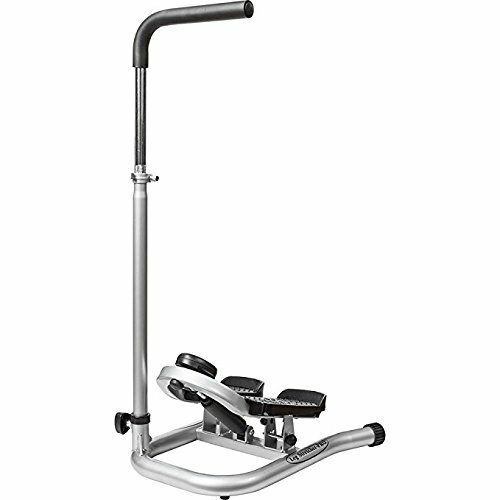 Sturdy and Durable: This stepper was made of heavy duty steel, it won't be damaged easily. And it can provide years of reliable use by normal use. If you have any questions about this product by Taiwan Present, contact us by completing and submitting the form below. If you are looking for a specif part number, please include it with your message.